Throwback Thursday this week is one of the Signer Dragons that I remember once hoping would be insane Blackwing support, Black-Winged Dragon. Before I get started, I’d like to point out the new Counter Trap, Blackbird Close, since it can summon this by negating a monster effect and sending a Blackwing to the GY. I didn’t intend on reviewing it this month cause I wanted to look at some of the other Blackwing support more. Anyhow, Black-Winged Dragon is a Level 8 DARK Dragon Synchro with 2800 ATK and 1600 DEF and requires 1 Tuner and 1+ non-Tuners. ATK is great, DEF is ok, generic requirements are great, DARK and Dragon are great. If you would take damage from a card effect, you place 1 Black-Feather Counter on this card instead and this card loses 700 ATK per Black-Feather Counter on it. Auster can help this generate counters as well, and this card preventing you from taking damage is great, but the 700 ATK reduction is kind of annoying, but at leas the effect prevents you from taking Trickstar burn if that is relevant to you. Once per turn, you can remove all Black-Feather Counters from this card to target a monster your opponent controls and it’ll lose 700 ATK per counter removed and your opponent would be burned for the ATK lost by this effect. Sadly they aren’t burned for 700 per counter removed, cause sometimes that would cause much more damage, but it is nice to send the burn back your opponent’s way as well as weaken a monster they have. This is clearly an anti-burn card which was odd for the guy playing Blackwings to have, but I guess Crow had a ton of terrible Blackwing monsters. 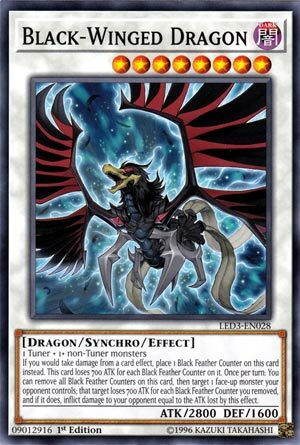 Black-Winged Dragon might be useful if burn becomes prominent unless Crystron Needlefiber into Life Stream Dragon ends up being more practical, but I don’t know when we’ll get Needlefiber, so I guess Black-Winged Dragon is your best anti-burn card for now. I really do wish this ended up being insane Blackwing support. Art: 4/5 So many black feathers! Black-Winged Dragon is our Throwback Thursday this week (two Crow cards in one week, cool!) this card was hurt upon release being as it should be a Blackwing card, yet none of the support worked for it, so what was a player to do with it? Level 8, Dark, Dragon, 2800 attack (1600 defense) generic Synchro Summon of a Tuner and one or more non-Tuner Monsters. But, realistically, this card is very likely to be destroyed before that happens, so the attack loss shouldn’t be your biggest worry. The more attack lost, it could be prudent for your opponent to let it drop and destroy it for more Damage…but that gives you more time to protect it. Finally, once per turn, you can remove all Black Feather Counters on this card to Target one (face-up) Monster your opponent controls. Then THEIR Monster loses 700 attack for each counter removed by this effect. If successful, you get burn from Black-Winged Dragon to the opponent equal to the total Damage done by this effect. This card isn’t at all bad, it’s just hard to fit the theme, but if/when Burn becomes prevalent, it’s certainly a solid choice then and there. But for now, this Dragon has a hard time finding a place in the Yugioh world. Art: Honestly, this strikes me as more a Zombie or Fiend, and the head looks more like a Dog than a Dragon, but that could just be me. Nice work of colors, the blue background is awesome, and the wings, as well as the legs and tail are pretty sweet.